After a hectic weekend working in Barcelona, we were ready for a couple days of rest and solitude. We knew only one thing: we didn’t want to leave the property for two days, and that’s exactly what we did. When Atzaró opened in 2004, it was, as everything in Ibiza was at the time, all buddhas and Bali in décor. 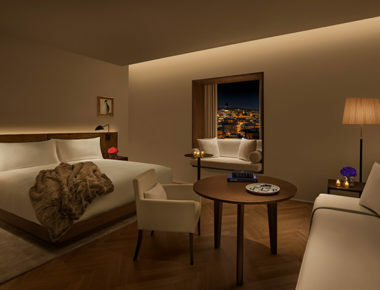 This year, the hotel has been taken back to its authentic Ibiza roots in an extensive refurb. 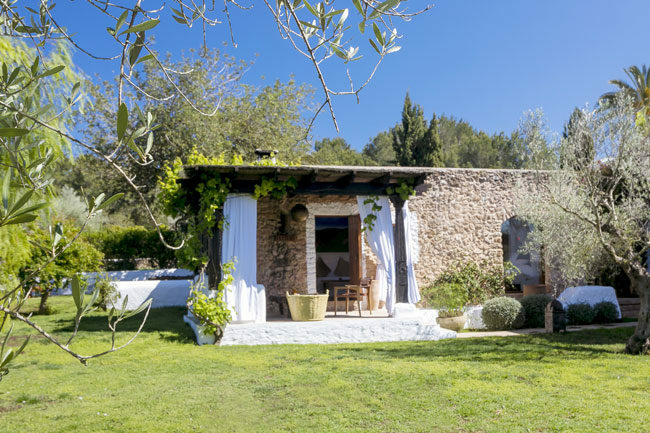 Centred around the original family farmhouse, expect cooling white finca walls with original features like fireplaces, and family photos on the walls. 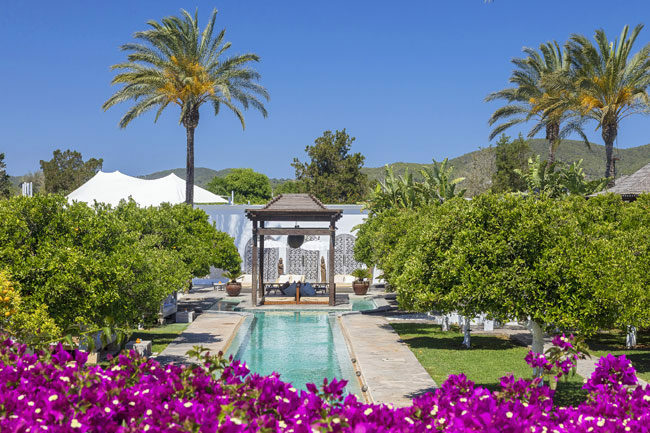 Set in the middle of 10 acres of orange groves and tropical gardens, you’re truly in the countryside away from it all. The 24 rooms are divided in location with suites on one side of the road, and rooms on the other side, around the main house – we definitely prefer to be around the house, but if you are after privacy, it’s straight to the suites for you. 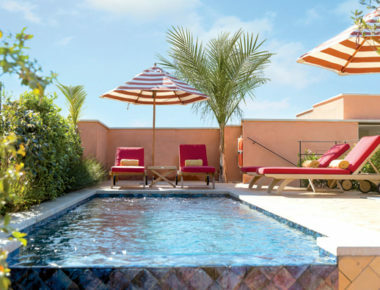 There are also two main pools and a spa, and several suites have their own pools. This is one chiiiiiiiill space, which was perfect. We’ve been here a couple times and this isn’t where you see ravers rolling in at 10AM. People are here to relax and recharge. 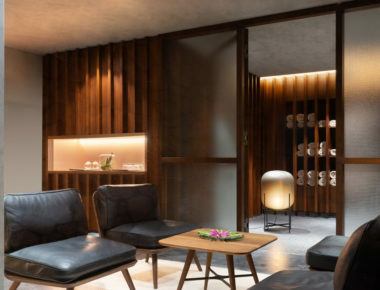 There are daily pilates and yoga classes and spa goers mosey freely around in robes and slippers; the dress code is definitely more spa-chic than tech chic. The soundtrack here is roosters and background beats; a refreshing break from the booming music heard at so many Ibiza hotels from morning to dusk. Calm radiates from this property. 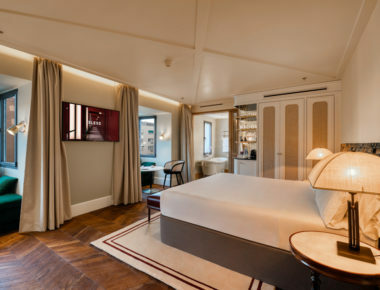 With teak, four-poster beds draped with cotton linens, terracotta tiled floors, marble washrooms and outdoor terrace/seating areas, even standard rooms feel like your own private Idaho, with plenty of room to really settle in. #UJLoves the rustic dry stone walls and wooden beams inside. In the height of the summer (July and August) The Orange Tree restaurant is open, where you can dine under the stars. Musicians are invited nightly to provide laid back entertainment – think flamenco, soul, and jazz. The smaller Veranda restaurant (we love) is open year-round, with indoor/outdoor seating. The menu here is refreshingly healthy, and of course utilises fresh, seasonal, local ingredients – this truly is farm to table. 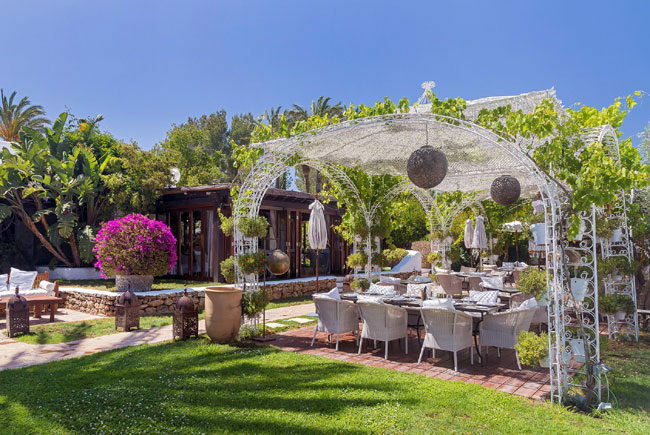 Dinner highlights include fideua with king prawns, tuna tataki and a variety of different salads, using veg from their garden on the grounds. They have great three course lunch offers, as well as spa and lunch packages. Make sure to get up for breakfast too; poached eggs with green garlic shoots, spinach, goats cheese and olive oil are not to be missed. 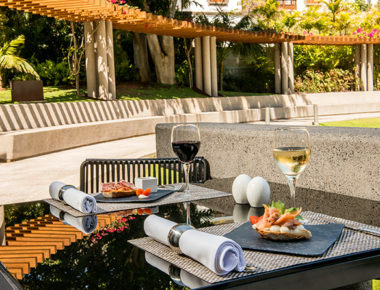 For drinks, it’s the pool bar by day and by night, it’s drinks on your room’s terrace. The spa and its long, rectangular pool are a definite highlight. Make sure to give yourself time to spend a day wafting from day beds in the orange groves to the hamman and treatment rooms. Choose from an array of different massages, including some more unusual ones (on request) like Somatic Therapy and Bioresonance IMEC (electrodes used to find acupuncture points they say). There are also facials, wraps, manicures and pedicures, as well as steam, sauna and two different temperature hammams. Although the gym doesn’t have the most up to date equipment, they do have laid back yoga and pilates classes and there’s also the option to take to the streets and go for a run – you are in the countryside after all, so do pack the trainers. They frequently have retreats here and offer private trainers, so you can definitely have a healthy time. If you want a change of spa pace, head for their sauna pod in the herb and vegetable garden. The space. This hotel has a lot of space for 24 rooms, so you won’t be tripping over each other. The relaxing vibe too was welcomed and gourmet yet casual dinners on the veranda meant you truly didn’t have to go anywhere. They own three other properties. 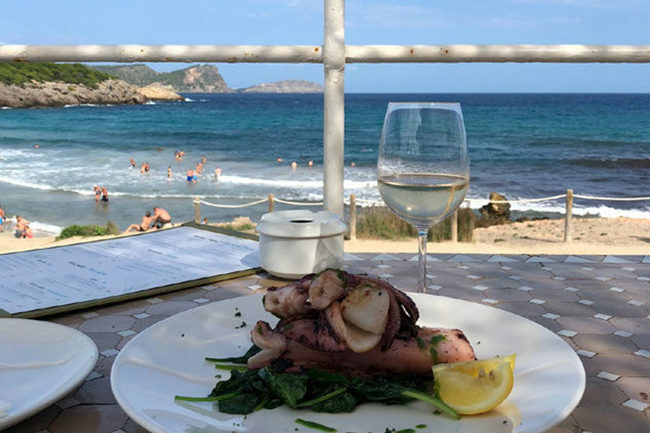 Atzaró Beach, which is of course on the water and offers day beds and seafood and The Chiringuito, a more casual beach spot, both in Cala Nova. 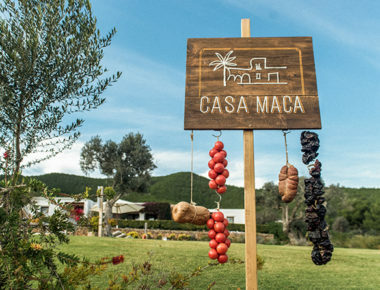 They also own Aubergine, the acclaimed veggie farm to table restaurant on the San Miquel road. Be sure to purchase some of their orangello, (orange liqueur), made from the oranges on their property, before you leave. Atzaró is open all year. 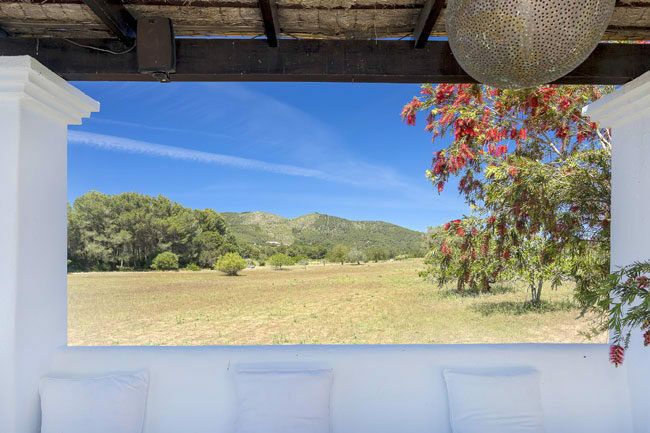 Winter is a great time to book into Ibiza. Check out their one- and two-night winter offers (including hiking and biking options) here. *Offers valid October – March, not including Christmas or New Year.